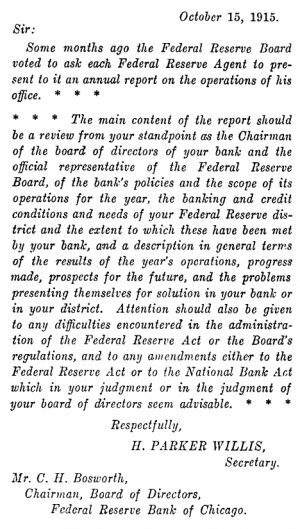 Letter from the Federal Reserve Board to the Board of Directors of the Federal Reserve Bank of Chicago, included in the Federal Reserve Bank of Chicago’s First Annual Report to the Federal Reserve Board; https://fraser.stlouisfed.org/title/472/item/579817?start_page=5. The new year offers a chance for organizations to reflect on the past year’s business. Annual reports formalize and capture these reflections. Traditionally, annual reports provide to stakeholders a comprehensive report on an organization’s activities throughout the preceding year. While corporate annual reports are a vehicle for reporting a company’s financial performance to shareholders, the annual reports of federal agencies report their duties and operations to Congress, the President, and the country. In our curated series “Annual Reports of the Federal Reserve System,” we have collected annual reports of the individual Federal Reserve Banks and the Board of Governors, along with other topical annual reports produced by entities within the Federal Reserve System, such as the Annual Report to Congress on the Equal Credit Opportunity Act. Although the regional Federal Reserve Banks have reported to the Board every year since 1914, the publication trends of Bank annual reports evolved over time. Early annual reports were fairly cut-and-dry balance sheet information and lists of key Bank personnel and directors. In the mid-20th century, many Banks ceased publication of stand-alone annual reports and incorporated them into their monthly business and economic Review publications. Modern-day annual reports often feature essays surrounding a theme, along with photographs and videos. In recent years, some Banks have even eliminated the print version of their annual report, focusing on more interactive web-based content. Annual Report of the Federal Deposit Insurance Corporation – As with some other content on FRASER, we monitor the publication of the FDIC Annual Reports and add the latest annual report to FRASER each year after it is published, making the collection on FRASER a complete run, from the first report of operation in March 1934 to the latest annual report for 2017. Economic Report of the President – Despite its name, the Economic Report of the President is primarily written by the Council of Economic Advisers and submitted to Congress by the President. It overviews the nation’s economic progress using text and extensive data appendices and was established by the Employment Act of 1946. The Joint Economic Committee annually produces The Joint Economic Report, with the Committee’s analysis of the Economic Report of the President and the nation’s economic status and recommendations for the upcoming year. The Financial Stability Oversight Council was established by the Dodd-Frank Wall Street Reform and Consumer Protection Act in response to the financial crisis of 2007-2008. Its Annual Report discusses the activities of the Council, significant financial market and regulatory developments, and recommendations to improve U.S. financial markets. Another response to the financial crisis was the creation of the Troubled Asset Relief Program (TARP). The Agency Financial Report contains financial statements for TARP, the Government Accountability Office’s (GAO’s) audit opinion on those financial statements, a separate opinion on the Office of Financial Stability’s (OFS’s) internal controls over financial reporting, and results of GAO’s tests of OFS’s compliance with selected laws and regulations. FRASER also has many historical annual reports. The Annual Report of the Secretary of the Treasury on the State of the Finances is the longest-running annual report on FRASER (1789-1980), and it contains the text of other sub-agency reports, such as the Mint, the Comptroller of the Currency, the Board of Supervising Inspectors of Steamboats, the Chief of the Secret Service Division, the Internal Revenue Service, and the Bureau of Alcohol, Tobacco and Firearms. The Annual Report ceased publication after 1980, but its data is available for recent years in the Treasury’s Agency Financial Report, the Treasury Bulletin, the Combined Statement of Receipts, Outlays, and Balances of the United States Government, and in annual reports of other bureaus of the Treasury. Annual Report of the Comptroller of the Currency – Like the Treasury Annual Report, the Comptroller’s annual report ceased publication after 1980, but the content continued to be published in the Quarterly Journal. The Annual Report resumed in 2003. 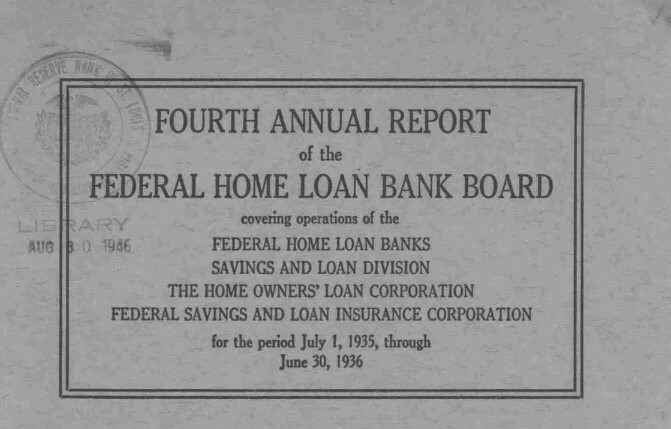 Annual Report of the Federal Home Loan Bank Board – Established in 1932, the Federal Home Loan Bank Board administered a number of entities and included reports on operations of those entities in its annual report, including the Federal Home Loan Banks; the Federal Savings and Loan Corporation created as part of the National Housing Act of 1934 and abolished in 1989; the Home Owners’ Loan Corporation created by the Home Owners’ Refinancing Act in 1933 and liquidated in 1951; and the Federal Savings and Loan System or Division established by the Board. Annual Report (Resolution Trust Corporation) – The Resolution Trust Corporation was a short-lived organization (1989-1995) created in response to the savings and loan (S&L) crisis of the 1980s, and its annual reports document the various activities undertaken. Annual Report of the Federal Trade Commission – From 1916 to 1998, the FTC issued annual reports to Congress reviewing the Commission’s previous fiscal year activity and providing descriptions of cases. Since 2002, the FTC has published Chairman’s Annual Reports, which detail the Commission’s achievements during the previous year. Annual Report of the Director of the Women’s Bureau – The predecessor to the Women’s Bureau, a war agency called the Women in Industry Service, produced the first annual report in 1919. In 1920, the Women’s Bureau was established as a permanent agency tasked with formulating standards and policies to “promote the welfare of wage-earning women, improve their working conditions, increase their efficiency, and advance their opportunities for profitable employment.” The Women’s Bureau continued with the second annual report. After 1932, the report was included in the Annual Report of the Secretary of Labor. Another curated series, “State Banking Reports,” contains reports from various state agencies providing information on the condition of banks regulated by the state. State-chartered banks are licensed, examined, regulated, and supervised by their respective state banking departments. To date, just a handful of states have been made available on FRASER for select dates. Contrary to the federal government, whose publications are in the public domain, state governments have the right to make their publications subject to copyright.